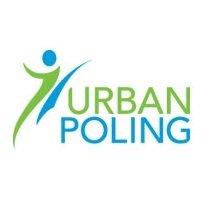 At Urban Poling Inc. we respond to questions like this every day via our website and social media platforms. Our website is packed full of information and ideas too–but the queries keep coming! Finally, there’s a comprehensive book that answers all of your questions, whether you’re just starting out or are a seasoned Nordic walking pro. The Urban Poling Ultimate Guide to Nordic Walking, written by our own director of education and professional writer Barb Gormley, is a full-colour digital guide that covers all the bases plus more. 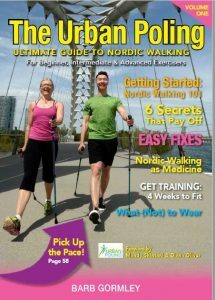 The 66-page guide is full of tips and tricks to make your Nordic walking experiences more fun and efficient. Available now at the kick-off price of $10.99 from www.urbanpoling.us and www.barbgormley.com. Barb is a health writer and fitness professional who writes for print and online publications. Her work has appeared in Chatelaine, the Toronto Star, Diabetes Dialogue and Fitness Business Canada, and for the publications of Brookfield Properties, the Canadian Physiotherapy Association and the Ministry of Health Promotion and Sport (www.barbgormley.com). Urban Poling Inc. distributes and designs high-performance Nordic walking poles, all with ergonomic and easy-to-manage strapless handles. It is the largest Nordic walking pole distributor in Canada and offers the only Nordic walking instructor training program recognized by Canada’s nine largest fitness organizations. It sells through retailers (including selected Shoppers Home Health and Shoppers Drug Mart stores) and online, and through its 3,500 Urban Poling-certified instructors (www.urbanpoling.us).